Universal Crescent Clinic is a free medical clinic to serve people without health insurance. The clinic doors are open to everyone regardless of their gender, race, religion and ability to pay. 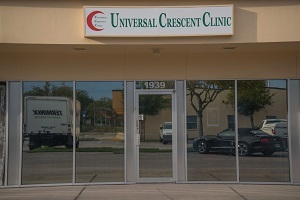 Universal Crescent Clinic offers free quality primary and some specialty care services to all those who do not have medical insurance, Medicare, Medicaid or whose income falls below 200% of the poverty level as set by the State of Florida. The services are provided by Florida State licensed physicians and trained supporting staff on volunteer basis. The running costs are covered by individual and corporate donors. Our efforts are driven by the belief that every human being deserves access to basic medical care and their physical and mental well-being is necessary for a productive and prosperous community. ©2018 www.ucclinic.org. All Rights Reserved.